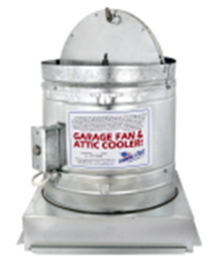 At Cool That Garage, we provide ventilation solutions for the garage and attic to move this super-heated air out through convection or hot air rising in the attic with cooler air coming in from the bottom and forcing this super-heated air out the existing attic vents. If you move this super-heated air from the garage and attic it will help lower the air conditioner load, and may reduce energy consumption. Radiant heat trapped in a garage raises the temperature at least 20 degrees or more than the outside ambient air temperature. Also, the attic above the whole house is as much as 40 to 60 degrees higher than the outside temperature. The attic and garage acts as a super-large radiant heater on the house forcing the air conditioner to work harder. It may be wired to a switch that allows you to turn the GF-14 Fan off or on so you can operate it in the winter months to ventilate your garage and attic as needed.